They say there are four stages in life. In the first stage you believe in Father Christmas. In the second stage you don’t believe in Father Christmas. 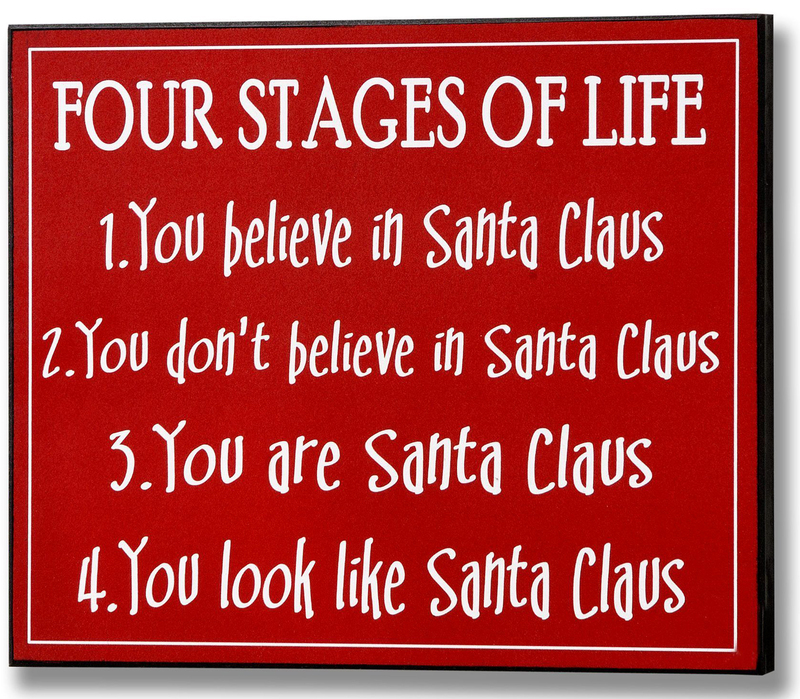 In the third stage you are Father Christmas. In the final stage you just look like Father Christmas. Doesn’t time fly? It’s Christmas Eve again. Another year. Hard to believe the year went so quickly. Have you noticed how the pace of life seems to accelerate the older you get? Why does time seem to speed up? There is apparently a scientific explanation for this perplexing phenomena. But with most scientific theories there are several explanations. Proportional Time: The most common explanation is that time is perceived as a proportion of time we have lived. To a five-year-old, a year is a long time because it is 20% of their entire existence. To a 62 year-year-old like me, one year is less than 2% of your life. Proportional time. Complex Time: Another theory is that as we get older, life gets busier and we have more things to do. We never seem to have enough time to get everything done so life seems to speed by. If you keep ‘to do’ lists you know what this feels like. Confession time – I currently have 19 ‘to do’ lists on my phone and the one in my Filofax makes 20. Conveniently they synch with my computer and tablet, usually. If not I end up with 38… Proportional time. Complex time. Stupid Time: It’s all about forgetfulness according to this theory. Memory weakens as the years pass and because we can’t remember what we did yesterday, let alone last week or last month, time seems to fly. Perhaps this is me, because the logic of this one escapes me. Tense Time: Time is perceived at different rates of speed depending on whether your mind is primarily thinking about the past, the present, or future. Children generally are future tense types. They can’t wait to be big enough to ride a bicycle or stay up late or be allowed to go to the cinema alone. They are always waiting for school holidays, birthdays and Christmas. Combined with the constantly moving target of age-related privileges guarantees that each wait feels like eternity. Teenagers live mainly in the future tense too, looking forward anxiously to leaving school, becoming 18 then becoming 21, buying a car, getting a job, having a real salary instead of pocket money, independence, freedom. For young adults there is the prospect of finding a partner, promotion, affording a newer car or bigger house. Even raising children is on future time – longing for them to grow out of nappies or to sleep through the night, or stop teething, then its vying for the best schools and saving for the right college. Time moves more slowly during the first half of life because we are anticipating the next thing we want rather than enjoying what is here and now. Once you hit the half way mark, which is often imperceptible because by now you are enjoying life, the incline gently, subtly changes from up to down, and we don’t notice until we begin to pick up speed. Older folks like me, tend to live in the past tense, recalling triumphs and tragedies of our younger years. We sometimes complain about new-fangled ways of doing things. We lament the loss of the “good old days.” Living in the past tense may speed up the perception of time because the anticipation of the new is gone. Five different concepts of time and why it seems to go slow or fast. They each have to do with chronology or sequential time—the ticking of the clock. In the Bible this is called chronos time. The Psalmist prays “Teach us to number our days aright, that we may gain a heart of wisdom” (Psalm 90:12). But there is a different kind of time in the Bible. Kairos time. If chronos describes our time, kairos describes God’s time. The word kairos is Greek for “opportunity” or “the right time”, the “fullness of time” or the “supreme moment”. In the Bible kairos refers to God’s timing. In his first sermon, Jesus said, “The time has come… The kingdom of God has come near. Repent and believe the good news!” (Mark 1:15). This was a kairos moment for those who heard Jesus. They were being given a one time opportunity. Sometimes chronos time and kairos time intersect like two different time zones. At the wedding in Cana, Jesus mother asks for his help when they had run out of wine before the end of the wedding. Jesus replies, “Woman, why do you involve me, my time has not yet come” (John 2:4). On another occasion his brothers suggest he should go to Jerusalem to show himself, even though they did not believe in him. In Paul’s letter to Titus, we see how chronos and kairos intersect. Kairos time has with it a sense of a divine turning point—”now is the time, now is the hour”—is central to kairos time. It helps us understand Paul’s earnest appeal to the people of Athens: “In the past God overlooked such ignorance, but now he commands all people everywhere to repent” (Acts 17:30). That “but now” is kairos time. Kairos time conveys a sense of expectation, a time for a decision. Quoting the Psalmist the writer to Hebrews says: “Today, if you will hear his voice, do not harden your hearts” (Hebrews 3:7-8). Tonight is one of those moments when chronos and kairos intersect. Tonight is one of only four occasions in the year when the timing of our church services is critical. On Remembrance Sunday we pause for two minutes silence precisely at 11:00am to remember those who have died for our country in war. On Good Friday we mark the Hour at the Cross precisely at 12:00noon for that is when as Jesus was hung on the cross to die for our sins. On Easter Sunday some churches hold a sunrise service to remember the resurrection of our Lord Jesus. And tonight – tonight at midnight the gospel story begins again as we celebrate once more the birth of our Saviour. How can we make tonight a kairos moment and not just another chronos moment? How can we live in both worlds, both time zones? How can we make the most of Christmas time? By recognizing the message of the angels is as much for us today as it was for the shepherds when first delivered. By moving from passive observer to active participant. “Good news … great joy!” Christmas is a time to celebrate all that God has given us and done for us. It’s a time to set aside your problems and pressures for a moment and focus on God. Because God wanted to communicate to human beings, he became like one of us and came to Earth. Now we can know what God is like because Jesus tells us. Of all the ways God could have come to Earth, he came the same way every one of us did — by a birth. Why? Because he didn’t want us to fear him, and no one is afraid of a baby! Christmas says God wants you to know him. A kairos for celebration. “a Saviour has been born to you” If we needed information, God would have sent a teacher. If we needed healing, God could have sent a doctor. But what we need most is salvation, so God sent us a Saviour. What is “salvation”? It’s forgiveness for my past, wisdom and guidance in the present, and assurance about my future. But like any gift, you must receive Jesus in order to benefit from him. We must stop trying to save ourselves and instead trust Jesus to be our Savior. A kairos for celebration and salvation. “on earth peace to those on whom his favor rests.” Christmas is a time to restore those broken or strained relationships. It’s a time to say “I’m sorry” and “forgive me?” It’s also a time to offer forgiveness to all those who have hurt you. First, make peace with God, and then you receive the peace of God. Once you have his peace you’ll find it much easier to make peace with other people. Take time this morning before you go to sleep and when you wake up to savour the incredible truth that God sent His Son, to live and die for the forgiveness of your sins, to fill the void in your life that Christmas presents can never satisfy and give you the one gift that you don’t deserve, can never earn and will last forever. Eternal life. Christmas was an amazing kairos moment for Jesus, planned from eternity. Christmas can be a kairos moment for you too, planned for eternity. I invite you to make this Christmas a Kairos moment in your life. And as you do, may God bless you and those you love. Thank you, Dear Lord, for the gift of your Son, born at the right time. We are rich in so many ways, but we too are poor in so many ways. So help us, God, not to trivialize our lives by running after what does not count and cannot last. Help us, Lord, to see this Christmas as a kairos moment. And not just on Christmas day but every day, help us to discern your presence and discover your perfect will for our lives. We pray in Jesus’ name. Amen. With thanks to Rick Warren and The Purpose of Christmas for inspiration and ideas. This entry was posted in Bible, Christmas, Sermons, Theology on December 24, 2015 by Stephen Sizer.